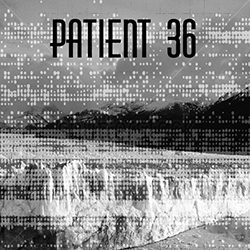 We are almost certain that someone who goes by the name of Erick Jäger is behind the Patient 36 moniker. Other than that, we actually don’t know that much with certainty. His musical history seems to have gone through a range of monumental ups and downs. Having survived childhood trauma in the alp region with psaltery, Hammered dulcimer, harp and yodel and the obligatory “Schuhplattler”, he found himself in the 90’s, releasing on Disko B and performing in the legendary Ultraschall club. In between, he had to walk a painful path which involved bell-bottoms, electric guitars and motor cycle accidents and finally led him to the realization, that machines actually are the better instruments. Not that this would have saved him from a detour into industrial and gothic music. And now? These days he produces occasional releases, each dedicated to a particular theme – always one of the big ones of course – with production support by one of our longstanding Broque buddies and conceptual ideas which go way beyond just music. We happily leave it up to you to decide if you can hear all of this on “Ein kleiner Tod”. While we are not sure about too many things, one is for sure: that this release is so packed with history, in between DAF, Disko B and Liaisons Dangereuses, as it is with passion and enthusiasm.